When London pipped Paris to host the 2012 Olympics and Paralympics, one small college in Hereford was among those popping champagne corks. The Royal National College for the Blind (RNC), home of the England Blind Football squad, has been quietly proceeding with a £21.5m development in time for its international appearance. It will stage the World Blind Football Championships in 2010 and is confident of hosting the blind football games at the 2012 Paralympics. The plans also include creating a "centre of excellence for sport and complementary therapies" for use by its 200 students and the community. 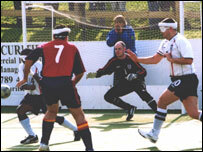 Tony Larkin, the England Blind Football team's manager, said the facilities were vital for the team and the sport. Mr Larkin, 51, has been coaching blind and partially-sighted football for 12 years and has helped the sport's development through the International Blind Sports Federation (IBSA). A former professional footballer, he played for teams including Hereford United and Shrewsbury Town during a 15-year career. Looking for a new career as retirement approached, he gained football teaching qualifications and applied to the RNC. "I had an interview on the Monday morning and that evening I began teaching 10 blind students and began really thinking about how best to adapt my coaching for their safety and to progress," he said. 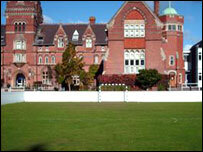 Mr Larkin said he soon saw how much blind students loved playing football and the opportunities it provided. "As well as helping fitness, it can help with mobility and spatial awareness and taking part is also good social interaction and helps to improve confidence," he said. He said the game had "really come on" since the first European Championship in 1997 and the skill and fitness levels were impressive. Great Britain's blind football team, ranked fifth in the world, recently qualified for next year's Paralympics in Beijing. While Britain only has six blind teams, Brazil, the world champions, has 120. The sport is popular in many countries, including Turkey which has 30 teams and it is also growing in Africa. At least eight teams will arrive in Hereford for the World Blind Football Championships. The new facilities will include indoor and outdoor pitches with permanent spectator facilities. Currently players have to be helped across a road to get to their changing rooms and spectator seating has to be brought in for tournaments. Mr Larkin said international players would be able to use the college's facilities which included technology such as the T3 talk and touch system which helps blind students find out information. At other tournaments, coaches have had to read out players' emails to them, he said. RNC students and the community will also benefit from the transformation of the campus, which includes improved accommodation, lecture rooms and a hydrotherapy pool. Robert Astick, the RNC's fundraising director, said: "It means real progress for the college which we hope will become the home of disabled sport and also bring great benefit to the community." He revealed a blind football academy was also being set up and 'scouts' would be looking for players who could get scholarships for the RNC. Louise Watts, community events fundraiser, said a new sports centre would particularly benefit vulnerable adults in the community. "It can benefit someone's rehabilitation, for example someone who has had a heart attack and wants to work at their own pace," she said. "It's all about feeling comfortable in the environment."